I actually appreciate it when folks email me to let me know about a comma fault or incorrect use of an apostrophe. I tend to screw up a lot and Craig Andera always drops me a note. He went to a better college than I. Er, me? Hopefully folks don't think TOO poorly of me when I misspell words. Of course, I think horribly of YOU when YOU misspell. 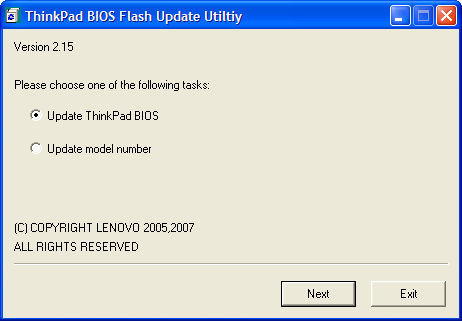 The real question is, how concerned should I be when my very expensive Lenovo ThinkPad T60p is about to have it's its ;) BIOS flashed by a Utility that's spelled (spelt?) itself "Utiltiy". Seriously, I think that the more folks use your product, the more effort you should put into Spell Check. Don't let the programmer check his or her own work. Get an editor. Someone with a B.A. in English. Not as funny as this (no political opinion here...anyone who mis-spells in public should be chastised): Jobs for Tommorrow! If you install the right tools into your IDE, little red squiggly will under those typos. At least you have a first line of defense. Funny you ask that, just yesterday I asked myself the same thing. I was even going to blog about it but then wondered if I was being too harsh. I found "allows" misspelled twice in a SQL Server 2005 properties panel. You can see it here. Its strange how something as simple as a mis-spelled word can give a bad impression about a piece of software. hmpf. The level of the literate today is not that high, but I dare not bother the general populace. You Scott however are not general populace so I'll make sure to watch your spellings and usage intently! As for the IBM junk it might be time to toss the blue and move to a more elaborate, large screened, and powerful machine. I have seen far too many things like that with IBM lately. From their laptops to their Tivoli Software. As being a blogger, who posts in English but does not speak the language natively, I do tend to make spelling mistakes. That's where spell checkers come in. In WLW, in Firefox, or CopyPaste to WinWord and back. Spelling is not an English Bachelor thing - it's a tool thing. As for grammer grammar - well, get an additorr editor. Bad spelling's a pet peeve of mine. It makes the product look sloppy and it's a warning flag - my logic goes "if they have trouble following the rules of a language that they've been speaking for 30 years, I should be extra worried when they're trying to speak in a language that they've been speaking for 5 or so years, shouldn't I?" I, of course, am exempt from my own scorn. Phew! I thought it was just me that was such a pedant about spelling! I like Dave Soloman's comment above. @dave solomon, I couldn't agree more. @dave solomon - You rock. Except for personal or very small projects, developers should not even be writing the text used in their applications. They should be externalized in resource files. A qualified editor (who need not know the first thing about programming) should be writing the UI text.